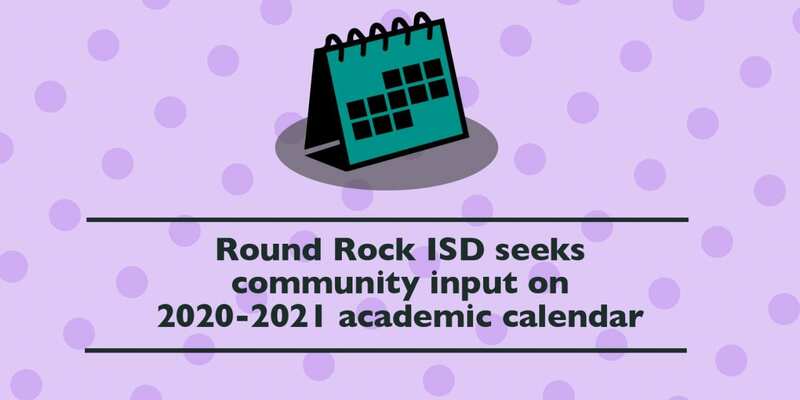 Round Rock ISD is seeking staff and community input on the 2020-2021 academic calendar and providing the opportunity to submit feedback through a survey between Jan. 18 and Feb. 3. A calendar committee comprised of District and campus administrators, staff, teachers, and parents designed draft calendar options for the 2020-2021 academic school year. The committee presented these to the Board of Trustees at the Jan. 17, 2019, Regular Meeting. The Round Rock ISD Board of Trustees will review the Calendar Committee’s recommendations and the community’s feedback prior to making a decision during the Feb. 21, 2019, Regular Meeting. Before taking the survey, community members can view option 1 and option 2. The drafts are also available in Spanish. The survey is available in both English and Spanish. Much like the 2018-2019 and 2019-2020 calendars, both Option 1 and Option 2 calendar drafts for 2020-2021 include 75,600 operational minutes. A state professional development waiver accounts for 2,100 operational minutes through the use of five Professional Development Days within the school year. The calendar drafts also include two days of instructional minutes banked in the case of school closures or delays due to inclement weather. Both Option 1 and Option 2 calendar drafts feature a school year start date during the third week of August, a full week break at Thanksgiving and two weeks off at Winter Break. Both also include professional development/teacher work days/non-student school days in August before the first day of instruction; in October on and near Columbus Day; in December and January on the days leading up to and after the Winter Break; in February on and near Presidents’ Day; and in May after the last day of school. Both Option 1 and Option 2 calendar drafts have the last instructional day occurring before Memorial Day. Each option includes four days per semester of 1:30 p.m. high school early release during high school final exam days. Daily tutoring will also be offered to all high school students from 8:30 – 9:00 a.m. and will begin each semester on the first day of the second full week of classes and continue through the day before final exams. The differences between the calendars include the day of school start. Option 1 starts and ends the year on a Thursday, which allows for May Final Exam Week to fit within one week. Option 2 starts and ends the year on a Wednesday, which creates a split May Final Exam Week for high schools and offers a slight balance of the number of days per semester.